Painting the exterior of a house takes a lot of work but is extremely rewarding. Learning how to paint the outside of your house properly ensures it will be protected against the weather for longer. With the available time and dedication, as well as the right tools, you can have a newly painted house that looks like it has been finished by a professional. Here at Mteevan Hire we hire out all the tools you need to paint the exterior of your home with ease and we’ve even outlined the step-by-step process for you. It is a fact that the majority of your time will be taken up preparing the house for painting. However, the one day you spend preparing the exterior of your home will save you at least three days of extra working and cleaning up afterwards. So, it is best to prepare as thoroughly as you can. Before commencing a paint job as time-consuming as the exterior of your house, it is important you plan the work you need to do. This may seem like an obvious point but planning ahead can save you a lot of time and help you focus on what needs to be prioritised. Take the time of note any repairs, sections of flaking paint, and list all the tools you need to get. Many people assume they’re ready to start painting as soon as the ladder is out of the shed. However, painting a house exterior can be physically exhausting and requires a lot of stamina so it is important that, if you’re not used to climbing ladders for example, you familiarise yourself with health and safety. It is also important you wear old clothes, such as paint overalls, when painting the exterior of a property. 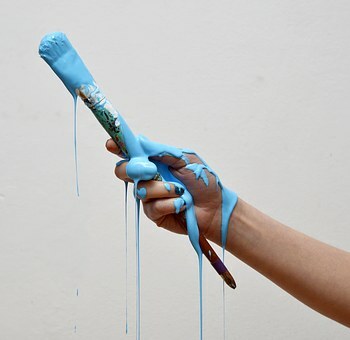 Many paints and wall coatings, especially waterproof or damp-proof paints, do not wash out of your clothes. So, wear something you’re prepared to get stained and dirty. Reading that list, it’s easy to understand why it’s so important to prepare the tools needed to paint your property in advance. Not only can you purchase the paints, brushes, rollers, and protective gear you need at any DIY store, but you can save money by hiring larger items like extension ladders and scaffolding from Mteevan Hire. The first step in how to paint your house is to clean the surface. As you’ll know, over time your house will pick up dirt, dust, and grime that will cover the exterior. And the first thing you need to know about painting a house is that you should not paint over this as the finish will be terribly uneven and messy. If you take the time to clean the walls beforehand, and allowing them to dry, your paint job will look significantly better and your home will be brighter than before. You can clean the exterior of your home easily using a hose to wash down the walls and a wire brush to help clean off any stubborn dirt. Remember, it is important to clean your house from the top to the bottom, allowing plenty of time for the walls to dry before painting. Top tip: if the walls of your home are particularly dirty and covered in a lot of grime, it is best to use a power washer. Just as you would clean your driveway, a power washer can be used to thoroughly clean the exterior of your home ready for painting. If you’re painting your house, it is likely the property is covered in discoloured, old, and flaking paint. If any of the painted surface is loose or flaking you will need to remove it before painting. If you don’t remove old sections of paint, this can stop fresh paint from properly sticking to the surface. Spend time working over the walls with a wire brush or paint scraper, knocking free any loose or old paint. If there are any rough surfaces left after this, use a power sander to smooth these areas so that your finished paint job looks smooth and even. The walls on the exterior of your house need to be ready for the paint, so it is important to check for any cracks or areas where old render has come away from the wall. Take the time to inspect your house for damage so that you can make any necessary repairs. 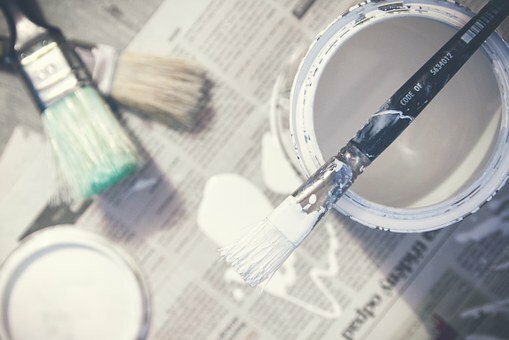 This may seem like a lot of effort, but it will help ensure that your house looks its best once the paint job is complete. Take the time to walk around the exterior of your house checking for popped nails, cracks, rust, and damage to window sills or door frames. Any sections of your property that are damaged are often traps for mould, dirt, and grime. So, it is important to clean these sections out and sand any rough sections down before filling the cracks ready for painting. If you want to achieve a clean and professional finish on your home’s exterior, it is important to put masking tape around the window edges. 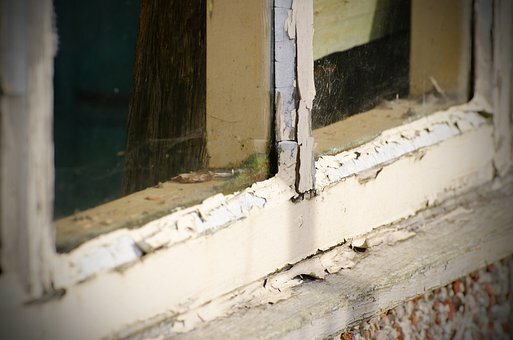 Make sure the tape encroaches onto the window frames just a little bit so that the paint does not spill over onto the frames (or worse, the glass!) Once you’ve taped around the window frames, you can easily paint without having to worry about working hard to achieve straight lines. Then, after you’ve finished the job you can simply lift the tape and reveal the clean lines around your windows. Now that your house exterior is ready, it’s almost time to start painting your property. Start by figuring out how much paint you’ll need so that you don’t waste money on excess paint. Figuring out exact amounts also helps prevent the likelihood of running out halfway through your painting project. You can estimate how much paint you’ll need by measuring the perimeter of the house and the height and then multiplying them by each other. You can then divide this number by the square foot coverage that is indicated on the paint can you want to use. This should give you the right quantity of paint (measured in gallons) required for a single coat. Alternatively, you can use a wall painting calculator to figure out how much paint you’ll need without having to do the maths yourself. Top tip: remember that the application method you use may also affect the type of paint you need. For example, if you use airless sprayers you may require as much as double the amount of paint as brushes or rollers/ So, keep this in mind. Primer provides a fantastic surface for the surface of your house before you begin painting. It helps the paint last longer and also provides your home with extra protection from the elements. Priming your home is especially important on any areas distressed or where you have scraped away a lot of loose paint. The type of primer you use on your property depends on the paint you’re using. So, if you’re planning to use a latex paint, you will need to use a latex primer. If you’re planning on using solvent-thinner paint, you will need to use a solvent-based primer and so forth. Finally, it’s time to decide which application method to use. Whether you use a brush, paint sprayer, or roller to paint your house is ultimately up to you. However, each application method provides different methods. Paint Brush: the majority of people painting their homes for the first time use a brush as it allows a far better control over the paint process. 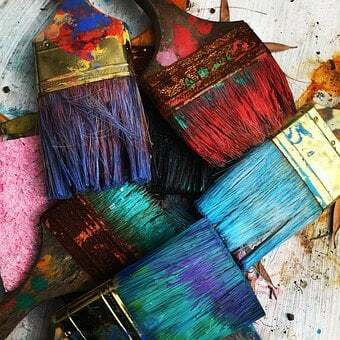 To paint your house with a brush, dip the bristles into the paint until they are halfway covered. Then, start painting! Painting with a Roller: to use a paint roller, roll it into a tray of paint until the entire roller is evenly covered. Then apply the paint to the wall using broad criss-cross stroked. Painting with a Paint Sprayer: to use a paint sprayer, load the paint you want to use into the sprayer and hold the sprayer upright (about 1 foot away from the wall). Move the sprayer smoothly back and forth, overlapping the previous section by a couple of inches every time. Spray painting your home is by far the fastest method but is only recommended for people who have used a spray painter before and know what they are doing. The best time to paint your property is when it is cloudy. Many people new to painting properties assume that the best time to commence work is mid-summer when the weather is at it’s hottest and there is a low chance of rain. However, while hot weather is extra hard to achieve in the UK, it is best to paint your house when it’s cloudy. The reason you should paint your house when it’s not too cold or warm, is because painting on a sunny day can cause eye strain as the sun reflects brightly off the paint. Cloudy weather also reduces the chances of the paint drying too quickly in the sun, creating a waxy-like film. So, try your best to paint when the weather is duller. One of the most important tips when painting the exterior of your home is to paint from the top of your property to the bottom. By starting at the top, on the ladder or the scaffolding, and working downwards, you have an opportunity to paint over any splashes or drips near the bottom of your property. Provided you work from the top downwards, you can more easily correct nay mistakes. Once you’ve painted the entire exterior of your home and allowed it time to dry, consider applying a second coat. Applying a second coat will provide extra protection for your home and will also help ensure the paint lasts longer and looks better. Of course, this step is optional and entirely dependent on both your budget and the available time. Once you’ve finished painting your house, take the time to step back and admire your work. If you’ve followed all the steps in this article, your home should look brand new with a smooth and professional finish! Painting a house is a big job and you’ll need access to all areas of your home. You probably don’t have elevation ladders or scaffolding sitting in your shed and you don’t want to buy them for the sake of one job. So, hire all the scaffolding and ladders you need from us today. Browse our full range of ladders and scaffolding now. With the right access and support equipment, you can make painting your house easier than ever.